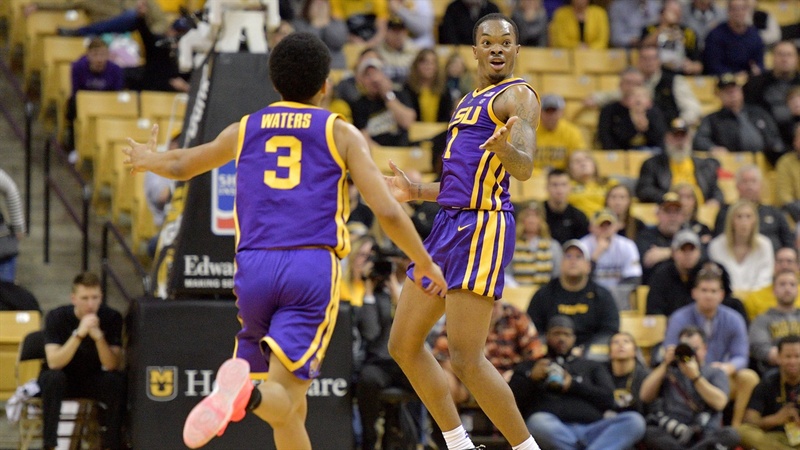 LSU overcame a 14-point deficit in slightly more than two minutes at the end of the second half and Ja’vonte Smart’s two 3-pointers in overtime led to an amazing 86-80 Southeastern Conference victory against Missouri at Mizzou Arena in Columbia on Saturday evening. Obviously, the overtime period was critical for the LSU victory. But, there would have been no overtime were it not for a 15-1 run by LSU in the final 2:07 of regulation. Skylar Mays scored nine points in 26 seconds to start the LSU spurt. Mays had two 3-pointers sandwiched around a three-point play to put LSU down by five points at 70-65 with 1:41 to play. Missouri turned the ball over twice in that short period of time on steals by Smart and Darius Days. After Jordan Geist made one of two foul shots, Tremont Waters made a 3-pointer with 1:20 remaining to cut the Missouri lead to three points at 71-68. Following another steal by Smart, Naz Reid made two free throws with 38 seconds to play. LSU had a chance to win in regulation after Geist missed a 3-point shot. Emmitt Williams was fouled with two seconds remaining. Williams made only one foul shot, so the game went into overtime tied at 71-71. Mays scored a career-high 24 points on 6-of-12 shooting from the field. Mays had missed four 3-point shots before connecting on two in the last 2:10 of regulation. Mays also made a career-best 10 free throws in 12 attempts. His two foul shots with nine seconds remaining in overtime put LSU on top 85-80. Mays also had a key basket early in the overtime period when LSU was behind by three points. LSU’s starting lineup consisted of Bigby-Williams and Reid in the post, Mays and Taylor on the wings and Waters at point guard. Bigby-Williams played 20 minutes – the fewest among the starters. Three starters were on the floor for more than 30 minutes – Mays (39), Waters (36) and Taylor (35). Smart came off the bench and played 33 minutes. . .Smart only made four of 11 field goal attempts, but all four were 3- pointers and two came in overtime. The four treys were a season-high for Smart. He also matched his season-best in rebounds with six. Smart had a season-high four steals. . .Waters was outplayed by Missouri’s point guard Geist. Waters missed 13 of his 17 field goal attempts, including a potential game-winner at the end of regulation. Waters was 2-of-9 on 3-pointers. He recorded at least nine assists in a game for the third time against a SEC opponent this season. The nine assists give Waters 316 for his career. He moved ahead of Andre Stringer and Ricky Blanton into ninth place on LSU’s all-time rankings. . .Reid was a perfect 9-of-9 at the foul line. The nine made free throws were a season-high for Reid, who missed 10 of his 12 field goal attempts. Reid had a team-high three turnovers. . .Bigby-Williams (2-of-3) and Williams (3-of-5) were a combined 5-of-8 from the field. Days missed his two field goal attempts – both from behind the 3-point line. He committed five fouls in only eight minutes. . .Taylor was 3-of-6 from the field. . .Tilmon and Pickett combined for 28 points. Entering Saturday, those two players were averaging a combined 18 points per game. . .Geist was 7-of-14 from the field, but he missed two shots on back-to-back possessions in overtime. . .LSU went ahead for the first time in overtime at 78-76 on a 3-pointer by Smart with 2:42 to play. After a basket by Puryear, Smart knocked down another 3-pointer following an offensive rebound by Williams. Missouri came up empty on its next two possessions as Geist missed field goal attempts. Two foul shots by Reid put LSU ahead 83-78 with 19 seconds remaining. . .Earlier this month, LSU won in overtime at Arkansas. It has been 40 seasons since LSU won two road SEC games in overtime. In 1979, LSU won at Ole Miss 70-69 and at Florida 88-82. . .LSU is 16-3 overall, 6-0 in the SEC. LSU is tied with Tennessee for first place in the SEC. The last time LSU won its first six conference games was 2006. . .LSU’s nine-game winning streak is its longest in 10 seasons. LSU won 10 straight games in 2009. . .Missouri is 10-8 overall, 1-5 in the SEC. . .The paid attendance was 11,513. LSU will play Texas A&M at Reed Arena in College Station on Wednesday. Tipoff is scheduled for 8 p.m. Central. The Aggies (8-10, 1-5) defeated Kansas State 65-53 in the SEC/Big XII Challenge at College Station on Saturday afternoon. The LSU-Texas A&M game will be available on ESPN2.